This article will proceed in the general order of assembly, plus there will be a summary at the end of the strong and weak points. This is a micro-ATX case arranged as a home theater component, with a nice burnished aluminum style front panel with two 5.25 inch, front accessible, drive bays. There is a good review of the case here. The case comes with a 380W power supply, so for less than $130 it is pretty good value. Antec makes quite good quality cases and power supplies, this is no exception though both the case and power supply have a few design bloopers which I will point out later. Antec makes a big song and dance about noise levels (and they are correct, the case is very quiet) and thermal issues. I'm not too certain about their "three chamber" design, I didn't notice it helping (or hindering) the cooling. 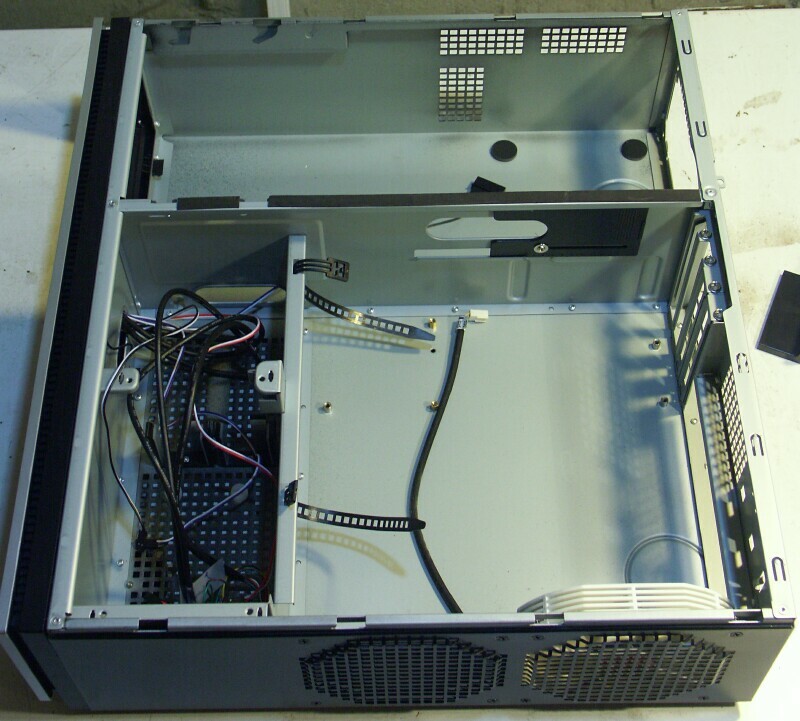 Above is the case interior, here I have removed the power supply and the 5.25 inch drive module so you can better see the three chambers that comprise the case. At this point I have already removed the two tri-speed stock fans that come with the case and replaced them with a single fan with 3-pin power that can be monitored and controlled by the motherboard. The side fans as seen from the outside, these are on the right side of the case. Antec ships a blank plate which you can use to cover up one fan hole if you don't need as much cooling. I have mounted a (white) fan (120mm Thermaltake unit) in one of the holes. This is the first Antec error, the two tri-speed fans that they include both use the old molex-style power connectors, so they are missing a speed sensor and cannot be connected to the motherboard. The rear of the case is pretty clean and standard. The little bit of black plastic behind the case is an airflow guide that attaches to two of the four square holes that are above the IO panel cutout. The front panel is quite plain, but it does blend in as a "component style" device. Just two USB ports, audio jacks, a power and reset switch and a drive light. This is the second Antec error, a firewire (1394) port should be included on the front and a memory card reader would also be quite useful. The above picture shows the empty drive bay for up to two 3.5 inch hard drives. These are cooled by drawing in air through the grid of holes below them. So don't stack this on top of some other hot component. 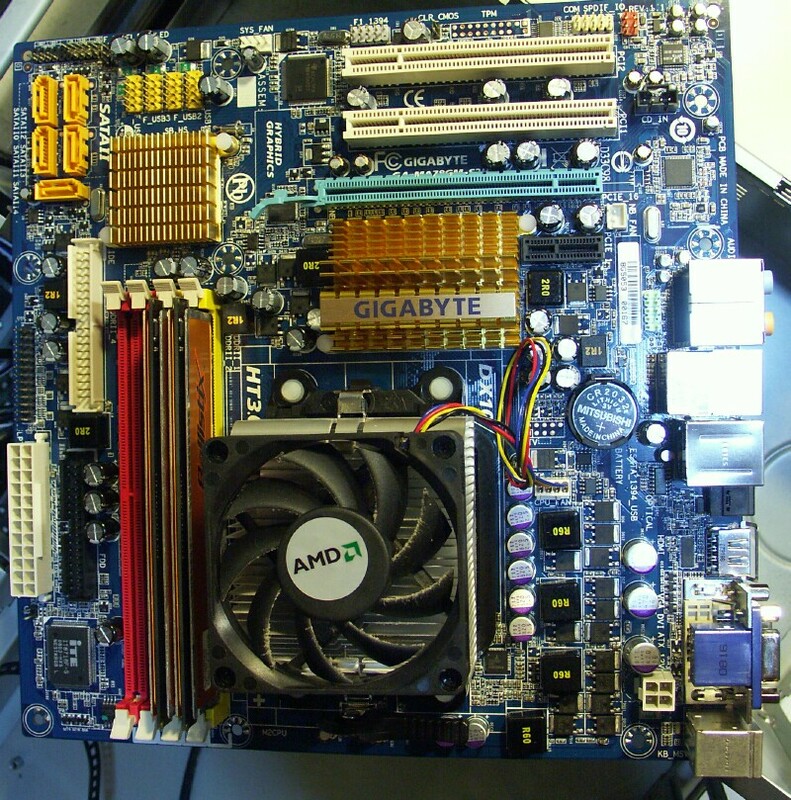 I chose the Gigabyte GA-MA78GM-S2H motherboard because with the 780 chipset it was capable of running full 1080P HD video without an additional graphics card. 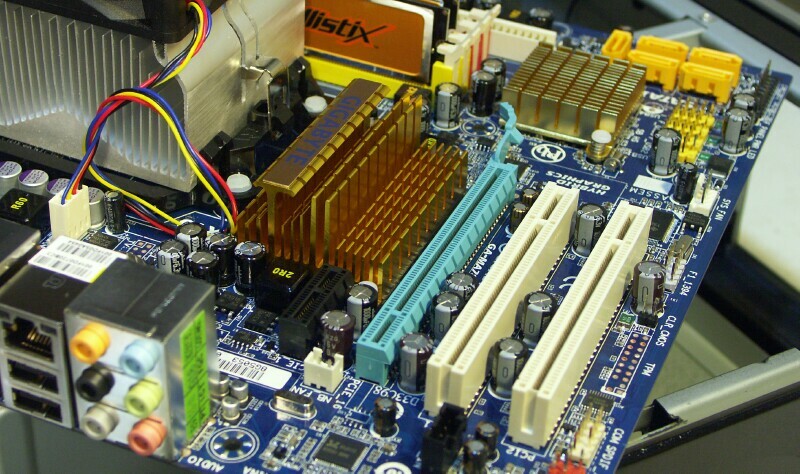 There are several competing motherboards, but most of them do not include firewire. I have actually had two of these boards now, the first was a revision 1.0, which failed after about 6 weeks of use and the second is a revision 1.1. The main difference between the two is that the rev1.1 board has a bigger northbridge heat sink. 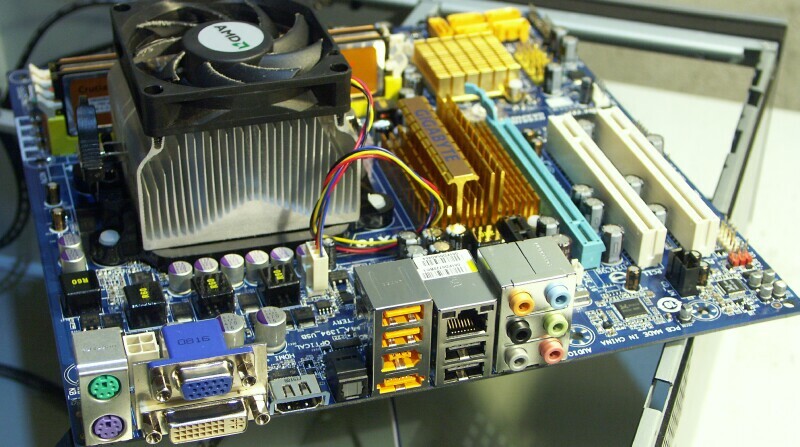 The motherboard has a good set of IO ports, in particular it has HDMI, DVI-D and VGA video connectors. It has 5.1 audio through standard jacks as well as optical audio (there is a header for the electrical SPDIF audio on the board too). There are 4 USB ports, firewire, eSATA and a gigabit LAN jack. The northbridge heat sink is the odd-shaped copper-colored one to the right of the CPU. From the top you can get a pretty good idea of how this fits together. Most of the cables you will be connecting are all clustered in the top left corner of this photo, where the SATA connectors are. The most notable exceptions are the motherboard power connector on the left near the bottom, and the extra 4-pin 12V CPU connector which is in the lower right. The PCIe 1x slot is a small black edge connector to the right of the copper colored northbridge heat sink, from this view you can see how the heat sink has been shaped to allow a card to pass over it. Another view of the northbridge heat sink showing how the first PCIe slot lines up with the low fins to allow a card to pass over the heat sink. 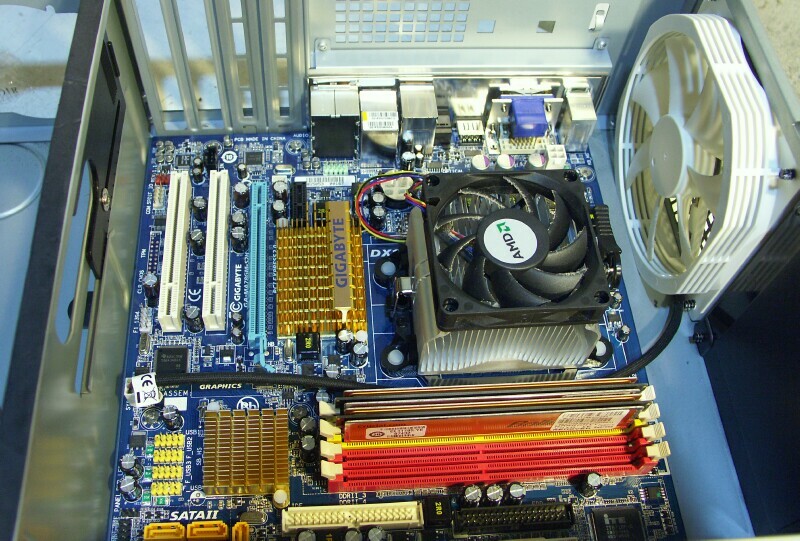 A view from the right side of the board showing the DDR2 RAM slots (800 or 1066 speed depending on the type of Athlon processor) and the CPU heat sink mounting lever. One thing that Intel boards do a bit better is to stagger the pairs of RAM rather than placing the two channels right next to each other. There are a lot of IO connectors along the front and left edge of this motherboard, it can get pretty crowded in the area of the SATA connectors. This is a better view of the SATA, USB and front panel connectors. The main things that are missing are the front panel audio connector (which is right at the back) and the firewire header (for front panel or internal use) which is on the left edge just past the top of this photo. Here you can see the internal firewire header and the clear CMOS pins. The firewire is right beside the PCI slot, which with this case design, makes it impossible to get to if a PCI card is installed. 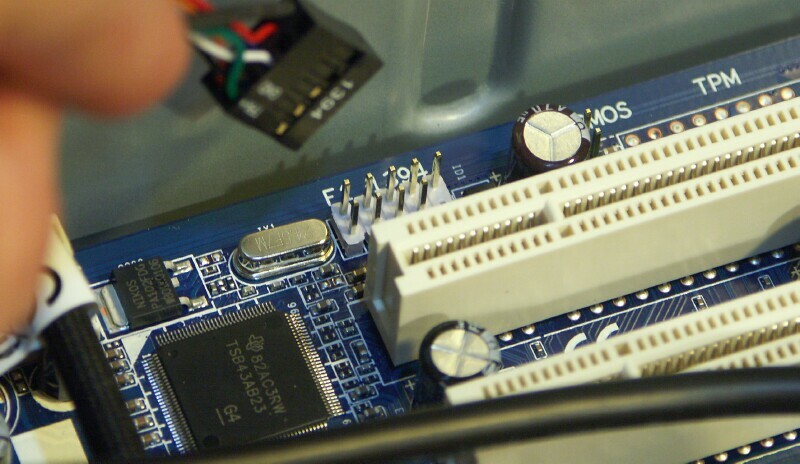 While that's not a big problem, just try to make use of the clear CMOS pins without removing your PCI cards first. The above photo shows the area near the back left of the motherboard, between the card slots and the back panel, here you can see the serial port, SPDIF, CD audio and northbridge fan (NB_FAN) connectors. 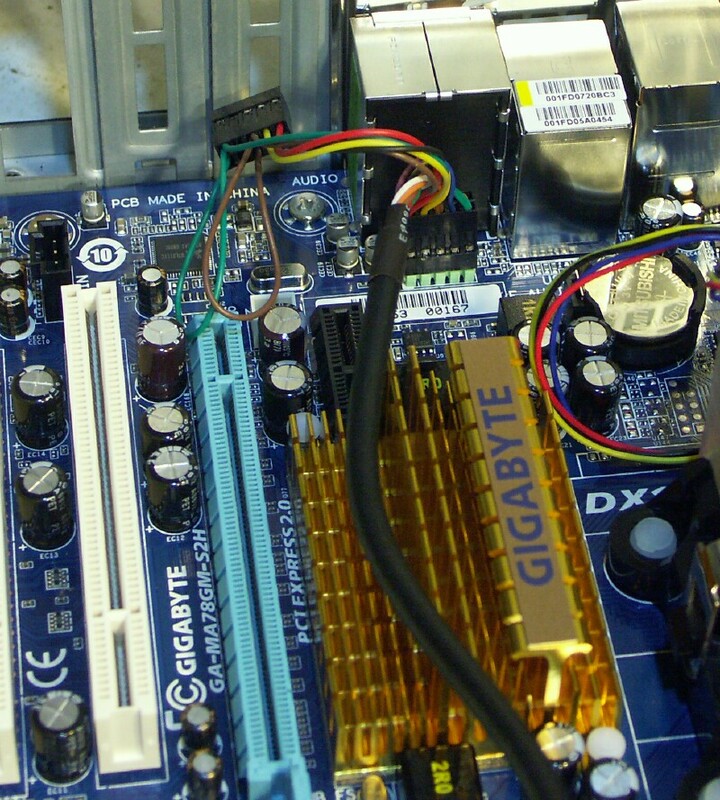 The motherboard does not include a fan for cooling the northbridge heat sink. The front panel audio connector is out of view, to the right of this photo. The motherboard is now in the case and I have connected the CPU fan and the 120mm case fan to it. Here you see another design flaw, these micro-ATX motherboards typically only have a single case fan header, and so you can easily end up having to run the case fan cable right across the board. It would make more sense to at least have a second connector. This error is made more obvious by Antec's case design which put the powersupply on the left and the fan on the right. If the case were just reversed then this issue would be eliminated and two other issues would be solved too. The front panel audio connector is right at the back (which probably is done because all the audio circuits are in that area) but it makes for a long, ugly, audio cable snaking across the motherboard. The front panel headers are pretty standard, but this particular case lacks two common things. First it does not have an internal speaker or beeper - I have attached one salvaged from an old case so I can hear the post beep code and know when to start hitting the DEL key to get into the BIOS on boot. 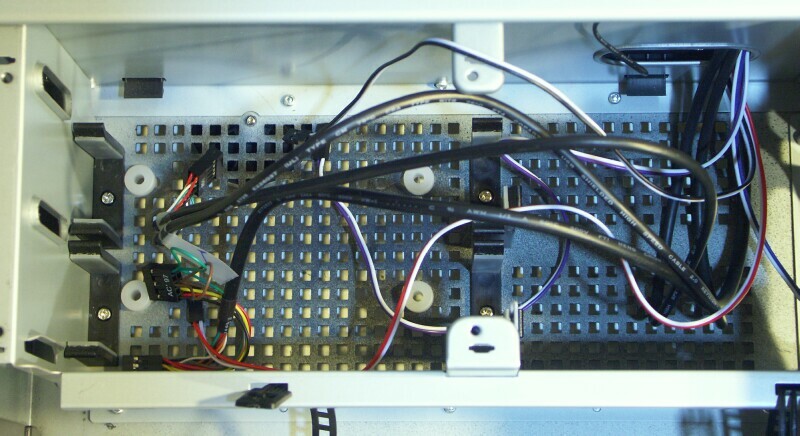 The second missing item (and this is quite strange) is that the case's power indicator light attaches directly to one of the molex drive connectors on the power supply and not to the usual motherboard jack. This is a bit of a problem because if the machine is in standby (suspend to RAM) the power light will be off - not blinking slowly. Here you can better see the unexpected 1394. It rather looks like the front panel circuit board has some support for a firewire connector which Antec (for some strange reason) has decided not to expose on the front. Now its time to hook up the front panel USB cables. 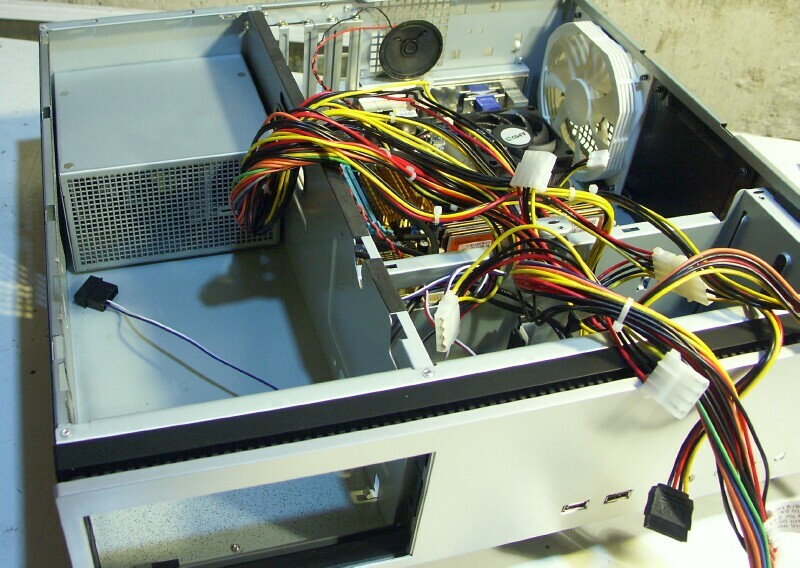 At this point I put the power supply back in the case, as is typical, it brings with it a rats nest of cables. Some of these will go though the hole with the black plastic slider. The cables that take power to the hard drives (in the lower left of the photo) have a hole underneath the 5.25 inch bay which you can just see in the lower left - in fact I missed this hole the first time I built the system. Another view of the power supply and cables. This time I have removed the 5.25 inch drive tray. One thing that is (I think) non-standard about this power supply is that the cables leave the supply on the right side, while other supplies you might be tempted to replace this with exit on the left side. This is a significant difference because those few inches might mean that the motherboard power connector cannot be reached. 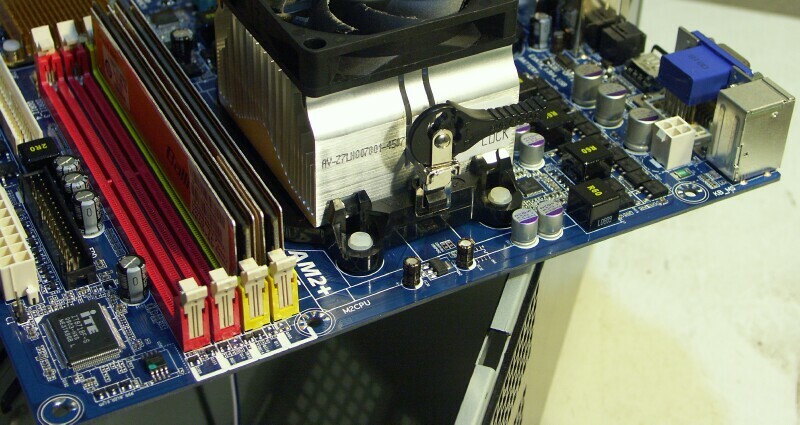 Again, if Antec had placed the power supply on the right side of the motherboard this issue could have been eliminated. I only realized this when I tried to install another power supply (another Antec one with more SATA power connectors) and found its motherboard power cables were too short. The little power connector with a black and white pair of wires is for the front panel power light. Another strange thing about this Antec power supply is that it has lots of molex connectors, but only two SATA power connectors. 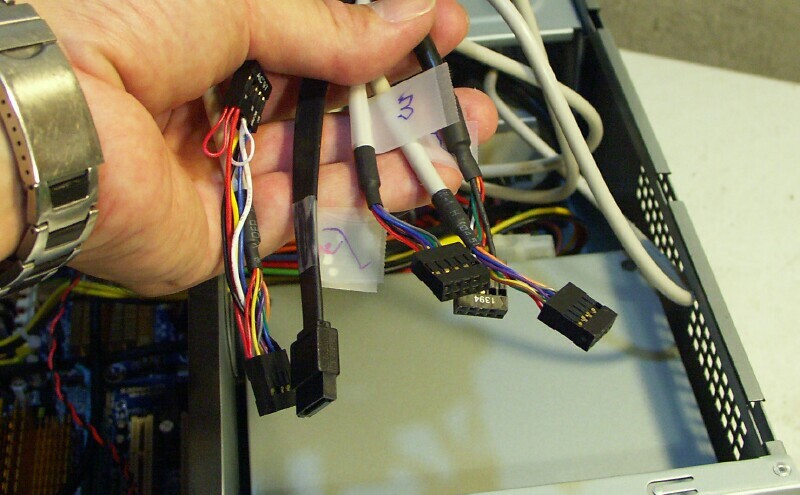 Now that would not be a big issue except both connectors are on the same wires, so if you have two hard drives and want to install a SATA DVD drive you need to get a molex to SATA power adapter. Not a big problem, but another unnecessary annoyance. At this point I have connected the main motherboard power (to the left of the RAM) and the 12V 4-pin auxiliary power cables. Again, if the power supply were on the other side of the case these major cables would not have to run practically all the way across the motherboard. 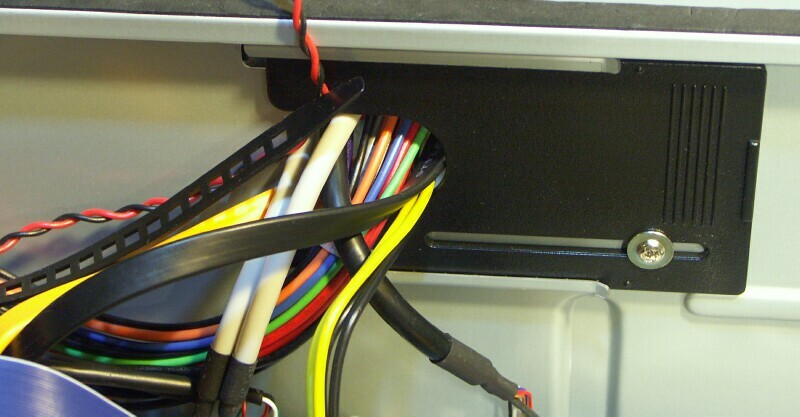 The SATA cables are an easy fit, but you would not want to run an IDE cable to the 5.25 inch bay. Which makes Antec's provision of only two SATA power connectors even more puzzling. This case has a rather unique, though pretty good, approach to mounting the 3.5 inch hard drives. Here I have placed the two drives in, but not yet screwed them down. Antec uses a nice rubber mount with a long screw to help isolate drive vibration to reduce noise. The hard drives have now been mounted in the case, the drive on the left is a SATA unit and the one on the right is an older IDE unit. 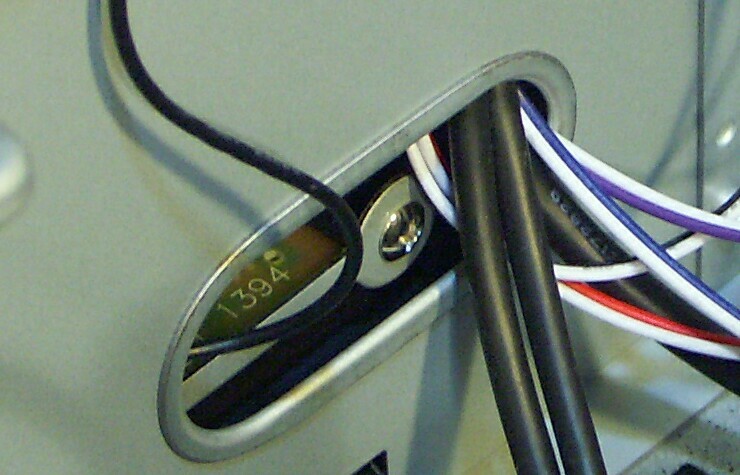 The IDE cable, while feasible in this case is quite bulky and the separation of the 3.5 inch and 5.25 inch bays make it impossible to run a DVD and a hard drive off the same IDE cable. Best to go all SATA with this case design, which gets us back to the power supply only having two SATA power connectors on a single cable. Why, Antec, why? To add a card reader and the missing front panel firewire port I got an Nmedia ZE-C98 IO panel. This you can see mounted in the 5.25 inch drive cage with the DVD drive. This whole assembly then drops into the case without any further screws being needed. 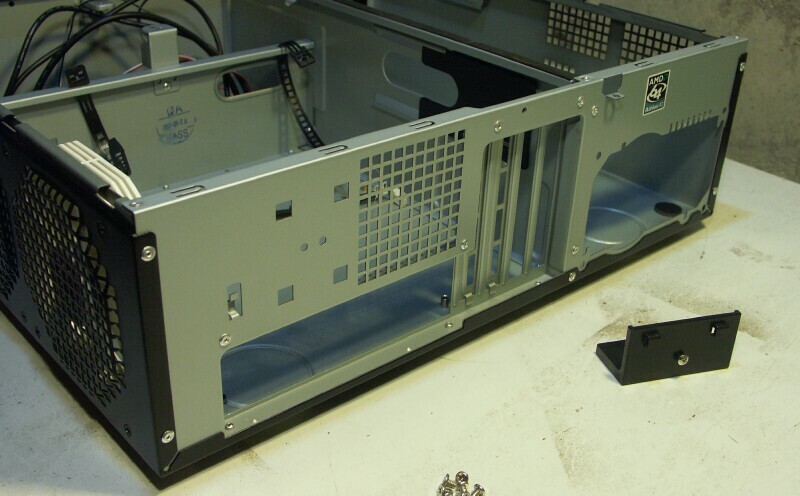 Here you can see the 5.25 inch drive assembly being placed into the case. Just slide it in at an angle and then slide forward some more while tilting it down. Nice and simple and no tools needed. The Nmedia IO bay has a lot of cables. The nice thing about it (compared to most of the competition) is that all of these are for connection directly to motherboard headers. It's hard to understand why so many front IO extenders are still being offered which run cables all the way through the case, then out the back, and turn around and plug into the computer's rear IO panel. There are 2 USB cables, a firewire, a SATA (to provide a front eSATA port) and an audio cable. I didn't attach the audio cable. 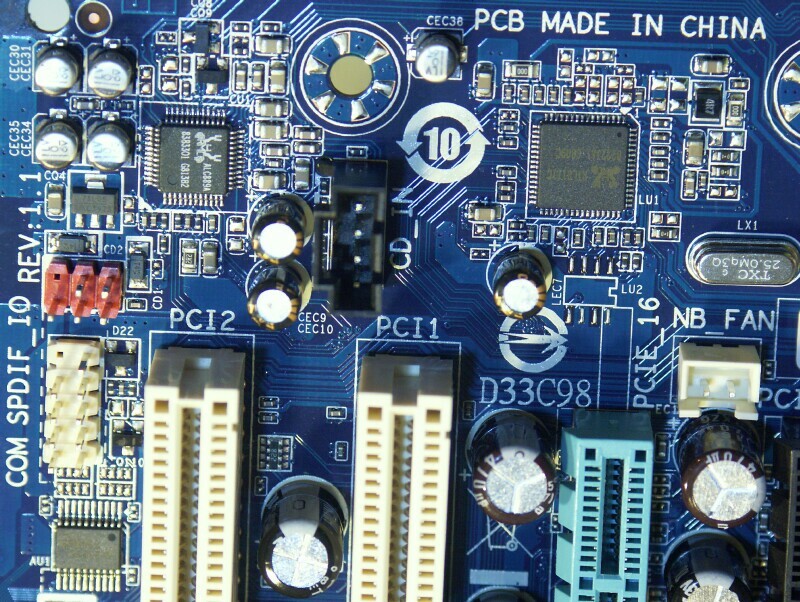 USBfever has some drive bay media readers that also appear to have motherboard connectors. The firewire connector gets hooked up. Once the firewire, SATA and two additional USB cables have been connected you can really see how crowded the cables get around the SATA connectors. This would not be nearly as bad if the big motherboard power cable didn't have to run right though all this (which could have been avoided if Antec had put the power supply on the other side of the case). This is a cute feature that Antec added, a sliding door to help a bit with taming all these cables (and to keep the power supply bay more thermally isolated from the motherboard area). This does have a major design flaw though. 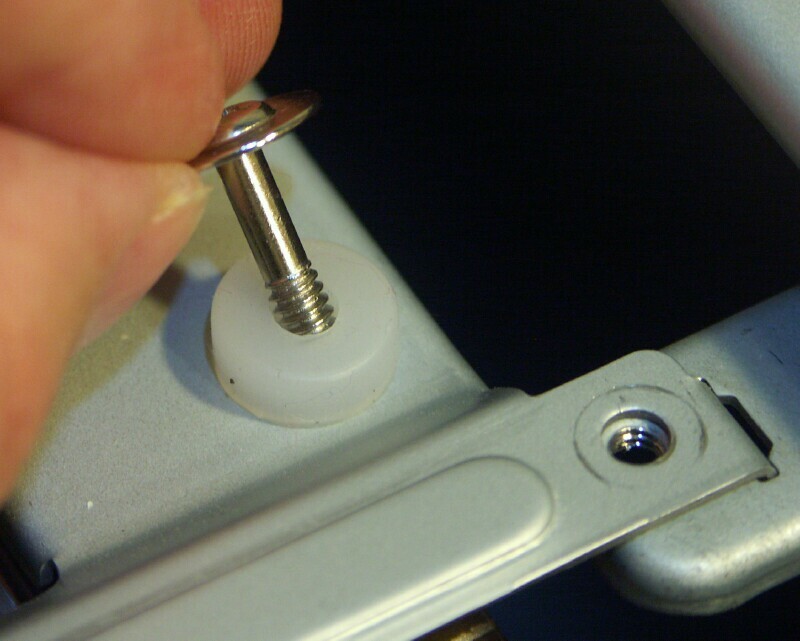 The placement of the retainer screw at the bottom edge of the plastic means it is impossible to reach without removing all your PCI cards. 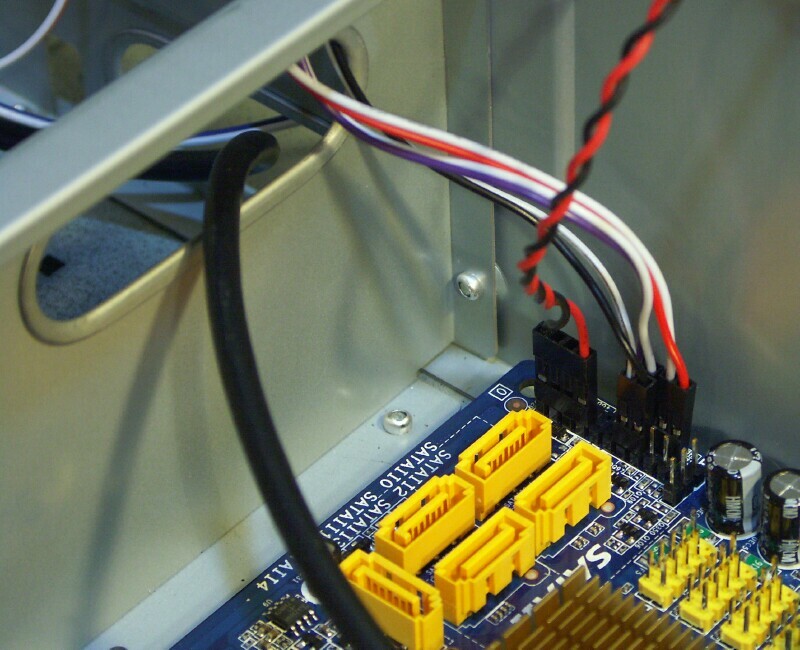 Here you can see that installing a PCI card, even one of minimal length, blocks access to the cable management door's retaining screw. If Antec had just put the screw on the top edge (or else put the door on the power supply's side of the wall) this issue would be solved. If you have long PCI cards you might also run into a problem with them interfering with the cables coming though the hole. Here you can see what I mean about the cables interfering with a long PCI card. In this case I have a short card (a single TV tuner) and a long card (a dual TV tuner) and it would be almost impossible to swap the two cards because of the cables. One final picture that shows everything hooked up. 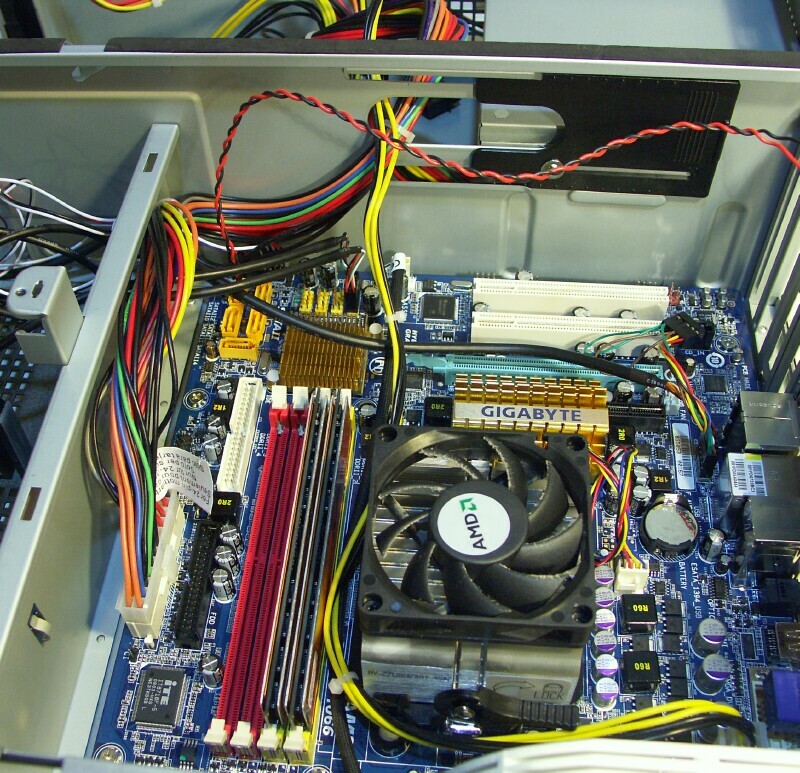 the included case fans do not have speed sensors and use molex power connectors rather than the 3-pin header connectors so cannot be connected to (and controlled and monitored by) the motherboard. the power supply does not have a fan sensor cable. the case fan's power cable must run right across the motherboard. 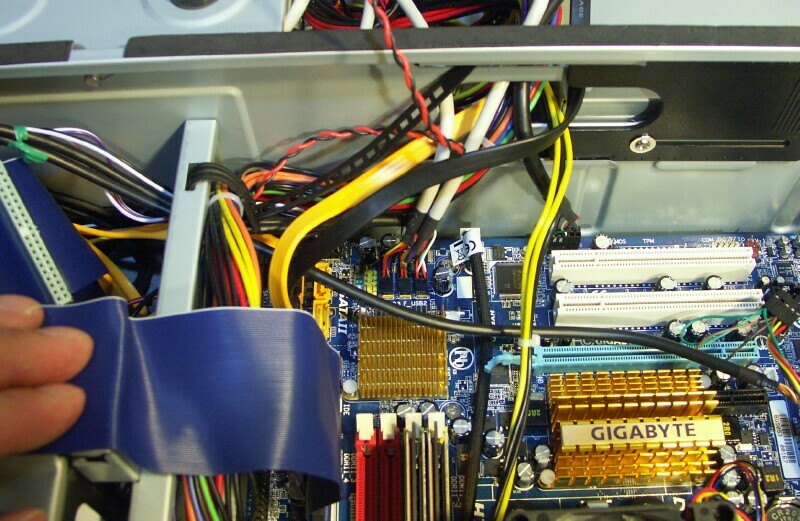 the 12V 4-pin ATX power connector cable must run right across the motherboard. 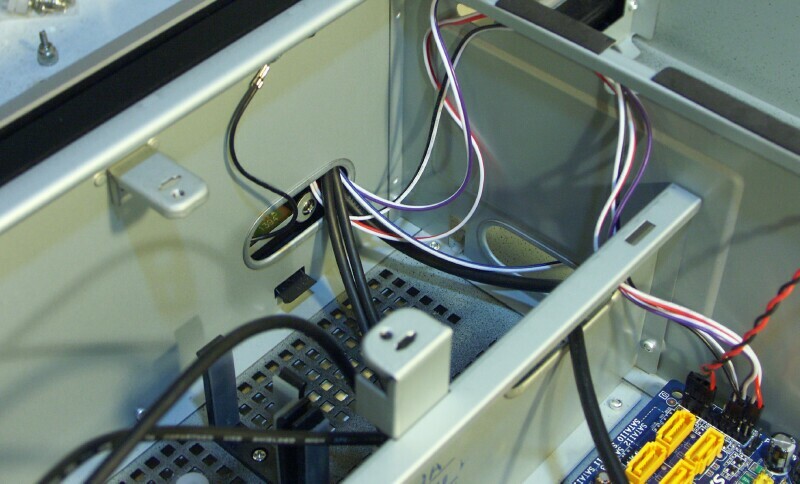 the main motherboard power cable must run right through the corner of the motherboard where most of the IO ports are (where the SATA, USB and front panel headers are). 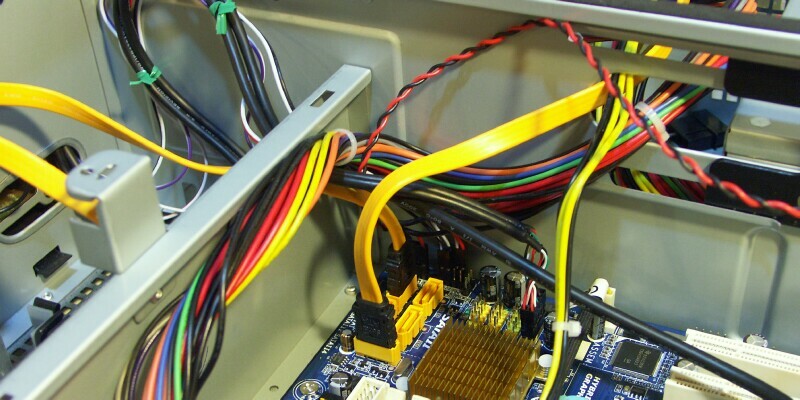 the 5.25 inch drive and power supply chamber should be on the right hand side of the motherboard rather than the left, this would alleviate a number of problems with cables crossing the motherboard and remove the need for a slightly non-standard power supply. the case does not include a speaker or beeper for post codes. 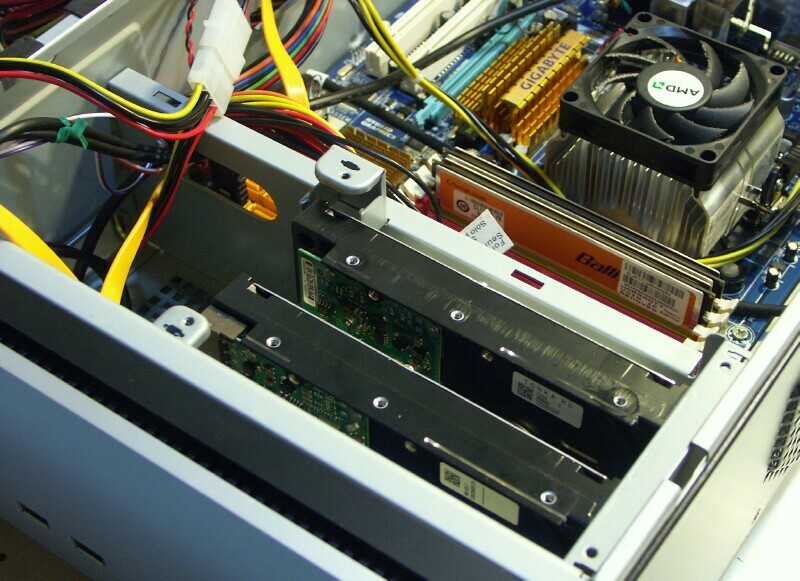 the case power light is very non-standard, it uses a molex connector for its power and it does not connect to the appropriate motherboard pins so the system cannot signal if the computer is in suspend to RAM mode. the power supply only includes 2 SATA power connectors, and they are both on the same cable. It really needs to have 4 SATA power connectors mounted on two cables. 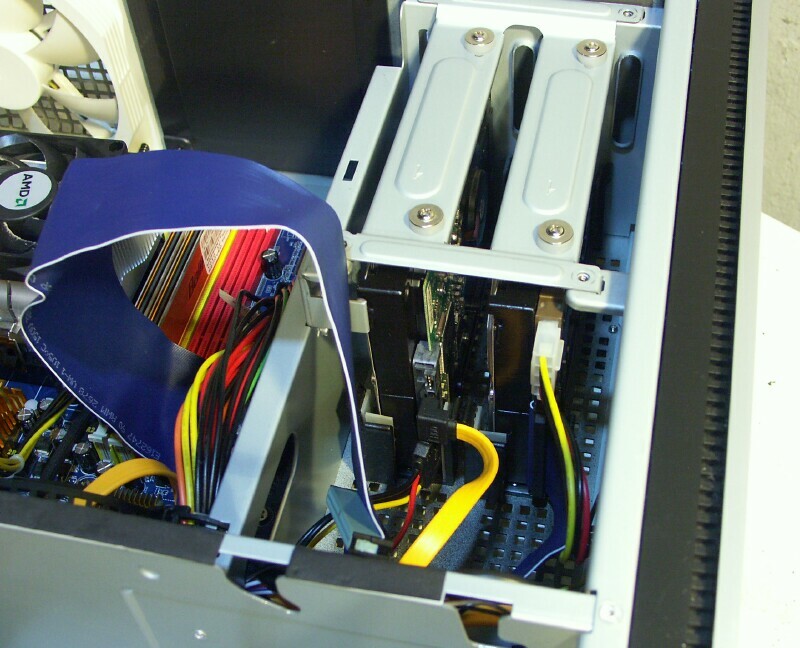 the cable management sliding door's retainer screw should be repositioned to the top of the slider or the slider placed on the other side of the compartment wall so it is still accessible when PCI cards are installed. 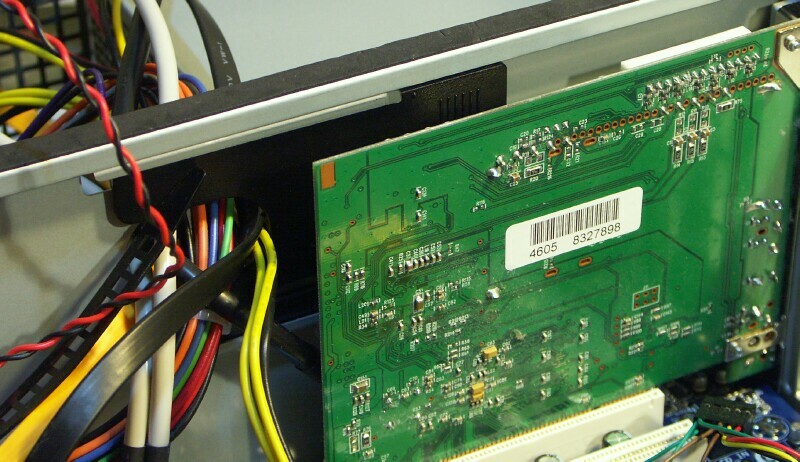 a large part of the large mass of cables that attaches near the SATA ports needs to run through the hole in the divider wall near the end of the PCI cards, this could interfere with a long PCI card. 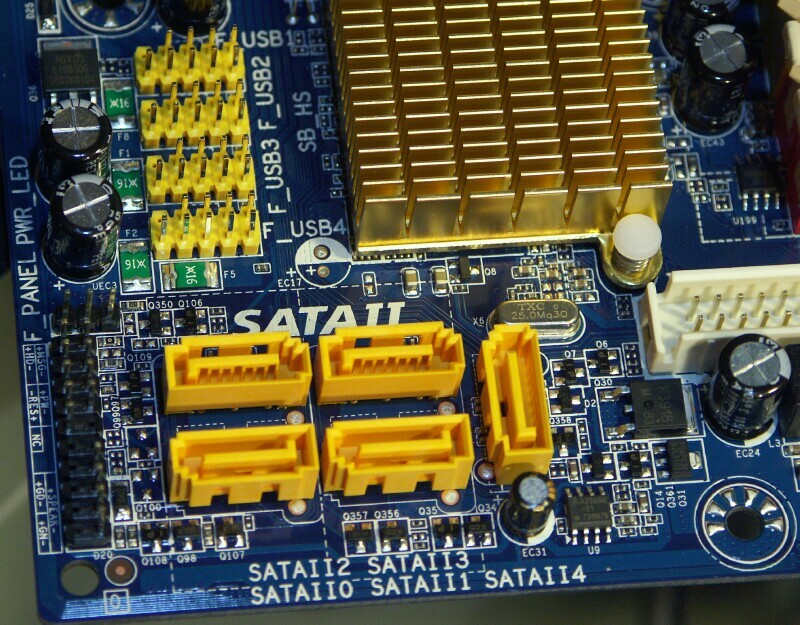 the northbridge heat sink on the revision 1.0 board may be too small. The larger heat sink on the revision 1.1 board is somewhat cooler, but is still somewhat hot. Perhaps a cooling fan for this should be supplied (the motherboard already has the connector for it). the clear CMOS header should be moved to someplace more accessible (though this is also a part case issue). 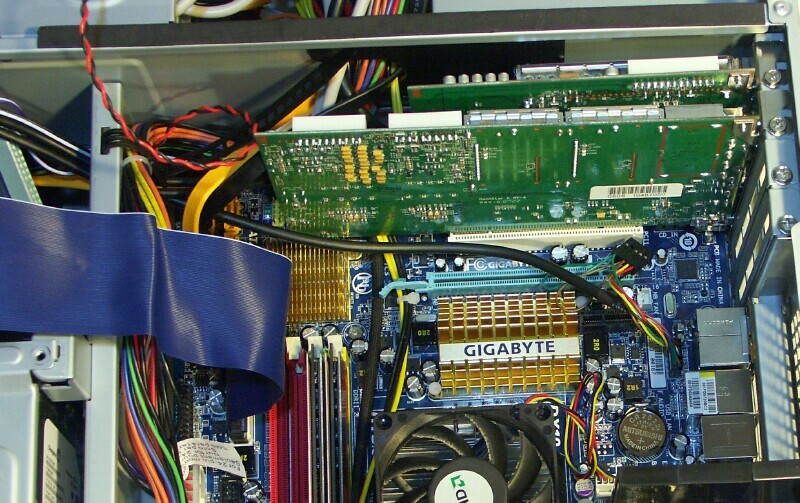 the firewire header should also be moved away from the PCI slots to somewhere more accessible. it would be nice to have an extra fan header or two. the LPT header should be moved to the rear of the board - but then who is going to hook up a parallel printer to this thing? It and the floppy connector should probably be removed. 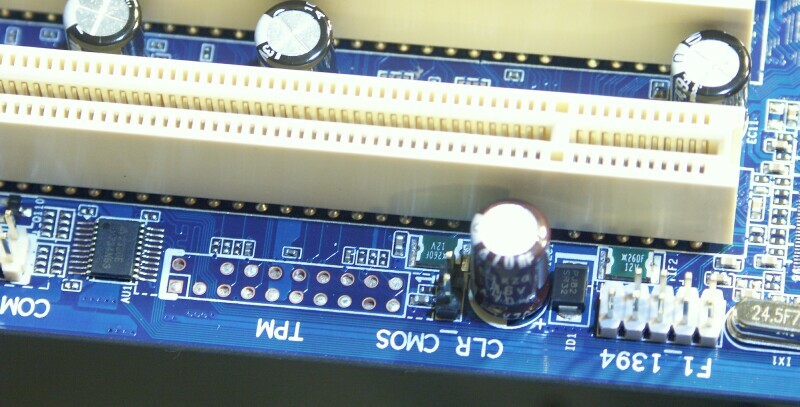 the front panel audio header should be positioned on the front edge of the board, not right at the back (though this might be impossible due to noise issues). 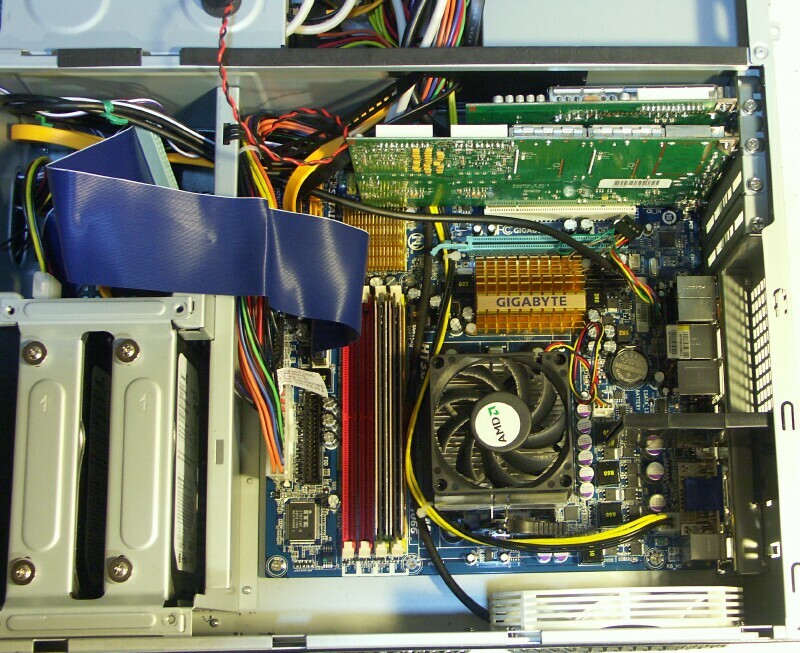 The motherboard is a very good board for building an HTPC on. The embedded graphics are fast enough to play 1080P HD material from disk (though I don't have a Blu-ray drive to try). It has all the ports you might want, including firewire for connecting cameras or set top boxes. Just add RAM, a tuner card and a CPU and you have all you need. The only significant weak point is the cooling of the northbridge chip, this has been improved with revision 1.1, though a fan on this might still be a good idea. I will certainly recommend this board to others. The case is nice, but could be so much better. 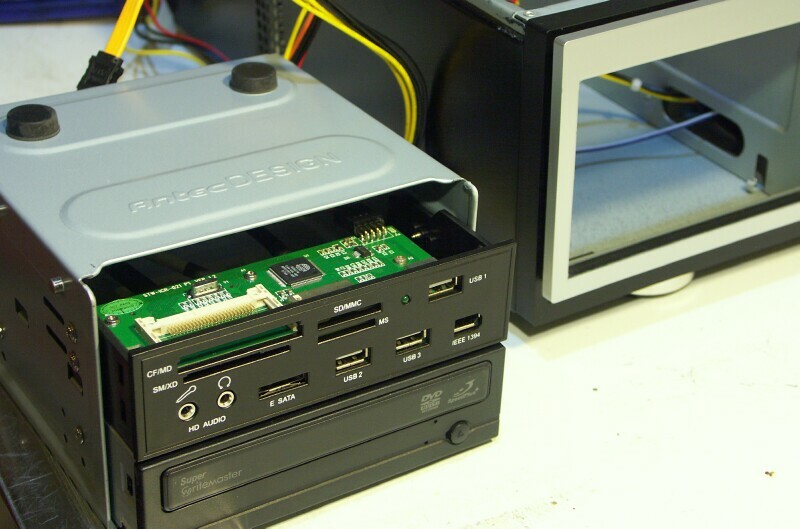 If only Antec would put the 5.25 inch drive and power supply chamber on the other side of the motherboard! Antec also needs to replace the fans with ones with proper 3 pin connectors (including speed signals) and to add another two SATA power connectors to the power supply. A firewire connector on the front panel would also be a very good enhancement. Even with these faults the case is a good solid box and is reasonably priced so its hard to complain too much.